I know a donkey named Nellie who once demonstrated the intention of movement so artfully that it would have made you weep with joy. Nellie lived on the farm of a retired veterinarian who owned many championship thoroughbreds and kept Nellie as a “lawn ornament.” Nellie was required to do nothing for her keep but be a donkey. She had never been ridden or trained or even asked to walk across a paved road and therefore spent a lifetime flatly refusing to walk on pavement or gravel. With hundreds of acres of pasture, it was rarely an issue. It’s a haughty group of horse people that live in this area. Too much money, too much fox hunting, too much of everything. 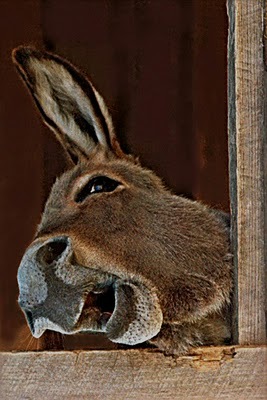 Too haughty to even lower their eyes to mock the substandard confirmation lines of an aging donkey and an aging eccentric woman who came to the stables every weekend to visit a donkey. You’d think a donkey so seemingly starved for personal attention would fawn and beg and bray and heehaw for the carrots, apples, and peppermints I brought. Not Nellie, proud Nellie so busy with living her donkeyness. I have spent hours in the pasture reading, writing, napping, feeding Nellie all manner of delicacies from the farmers’ market, brushing her, petting her, flipping her lovely ears back and forth and in circles like radar antennas. When I would laugh, she would bray. What gusto there is in a donkey bray! The whole body takes part and infectiously requires some kind of response from the universe. Nellie moved very slowly and not before a great deal of deliberation went into the decision of whether to move, where to move, and why to move. This was fine with me. I’d hold a carrot in one hand while I read and eventually Nellie would find her way to it. At the time, I was reading about Chi. All very interesting but I wondered where does chi reside when one isn’t moving and in what form? When a dozen thoroughbreds thundered down upon us with flying hooves and tossing manes to steal the fruit and vegetable booty, it was easy to witness the life force coursing through their bodies. They are bred without a rheostat. They are either on or off and bred to run so swiftly that it takes the breath away to witness it and fires our carnal hedonistic desires to saddle up and ride that sense of abandonment so carefully choreographed as an almost out of control flight from gravity. Yet it was a donkey never ridden that was chosen to bear a messiah into Jerusalem and it was an old testament donkey, not a man, not a thoroughbred, who saw an angel blocking the road and refused to move even when beaten, the same donkey who spoke to Balaam of his folly. So lie down in green pastures with me and contemplate the chosen nature of a homely aging donkey and try to catch a glimpse of subtle chi as one slender burro leg raises itself off the ground and slowly comes down again before another foot starts to move and then the next foot and the next and then a pause of movement that is no longer an empty category or the mere absence of movement but a gathering of intention, a wisp of desire that exists with its own sense of purpose and humor. As a myopic human who can’t see angels in the middle of the road, I was not shown this feat of feet with just one step or two but dozens and dozen of graceful steps until I could match my breath to the slow cadence and realize that my own breath existed with its own consciousness, sense of purpose, compassion, and even humor. It made me laugh and dance with a donkey, and the donkey kept time and brayed. This entry was posted in My World and tagged not protected by Caroline. Bookmark the permalink.